Announcing… Our Next Three Cook the Books Picks! 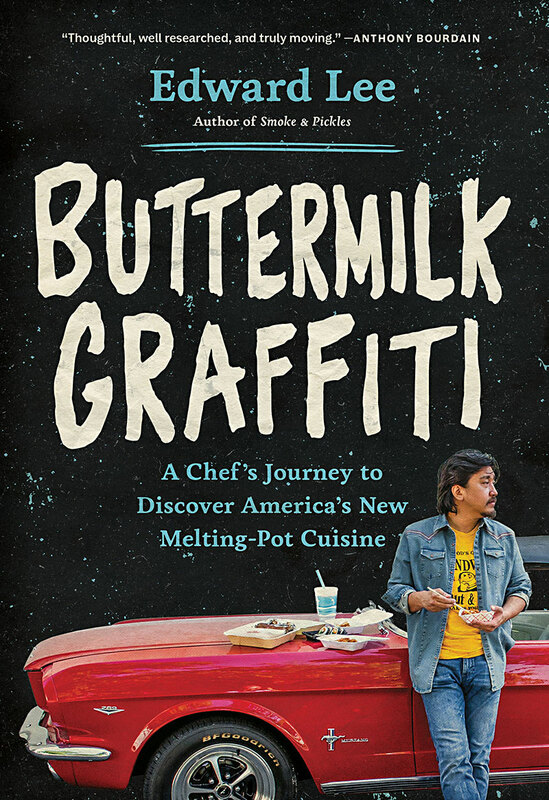 It’s time to announce our next three bi-monthly foodie book selections! While you are delving into the current book, The United States of Arugula by David Kamp, you can start begging, borrowing or finding gently used copies to purchase of our selected books through the end of the year. 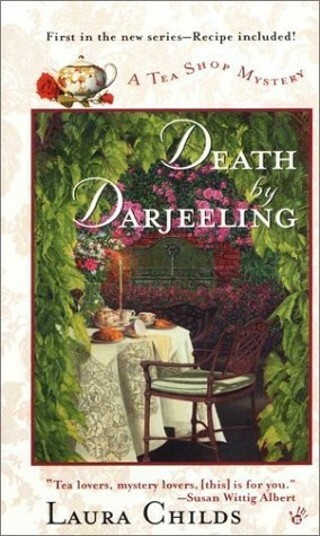 The deadline for “Death By Darjeeling” is Monday, July 30th. At Kahakai Kitchen, I (Deb), have become enamored of a little book of food essays,“Home Cooking: A Writer in the Kitchen“ by Laurie Colwin. Colwin was the author of five books, as well as a food writer and a contributor to Gourmet and other magazines, who died unexpectedly and tragically young, in 1992 of a heart attack at age 48. 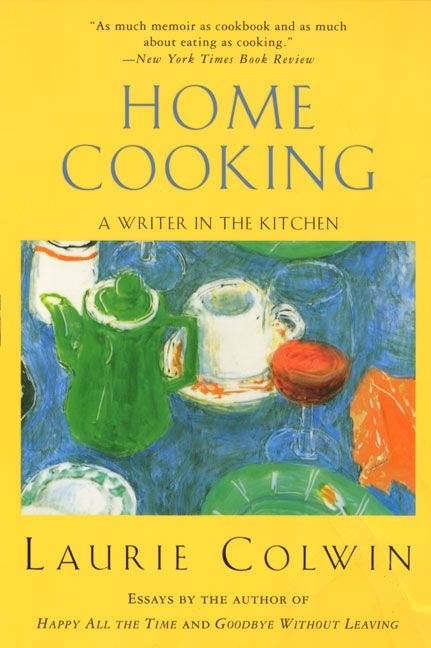 “Home Cooking” is a small and wonderful collection of stories and memories about food, interspersed with recipes. Colwin wrote in a casual, warm style and with such a sparkling sense of humor–laughing about herself and her experiences–both good and bad in the kitchen. If you haven’t experienced her before, I think you will fall a little bit in love with her writing. It’s a short book so if you are feeling extra ambitious, feel free to read her follow-up More Home Cooking: A Writer Returns to the Kitchen, as well. The deadline for “Home Cooking” is Monday, September 24th. 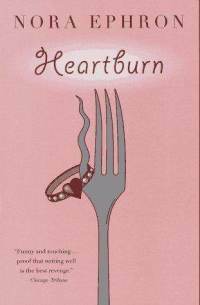 The deadline for “Heartburn” is Monday, November 26th. So grab a copy of each of these books and join us for some foodie fun! If you are new to Cook the Books we would love to have you join us–you can check out our guidelineshere. Happy reading, cooking and eating! 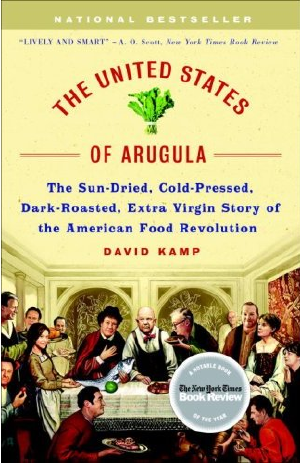 United States of Arugula: The Sun Dried, Cold Pressed, Dark Roasted, Extra Virgin Story of the American Food Revolution by David Kamp. From the author’s site: United States of Arugula is a book about one of the happiest developments of our time: the quantum leap forward in food choice, food quality, and culinary sophistication in America in the last sixty years or so. The book examines not only the social forces that effected this transformation, but the visionaries who changed American food for the better: among them James Beard, Julia Child, Craig Claiborne, and Alice Waters.” We should all find plenty of inspiration to cook from this fun look at the world of food. The deadline for your entry for United States of Arugula is Monday, May 28th. 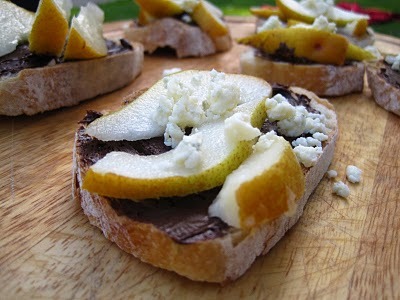 So please either email me at: jdimopoulosAT foodjunkie.eu, or leave your post comment here. We Have a Winner: The Most Scrumdillicious Dish from Charlie and the Chocolate Factory! Thanks to everyone who participated in our latest Cook the Books selection,Charlie and the Chocolate Factory by Roald Dahl. Such wonderful dishes both sweet and savory, and excellent posts with your reviews, thoughts and feelings about reading (or rereading in many cases) this classic children’s book. If you didn’t get a chance to view the roundup and look at all the posts, here’s the link. A very big THANK YOU! 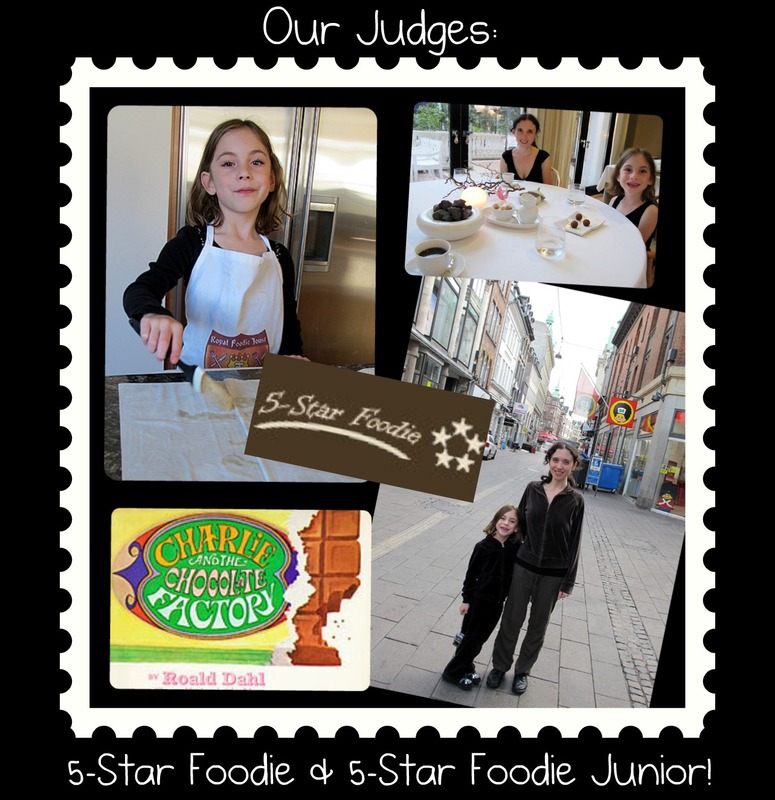 to our two fabulous judges, Natasha of 5-Star Foodie and her daughter Hannah, 5-Star Foodie Junior. It wasn’t an easy decision for them, but not only did they pick a winner, Hannah had comments for each person on their entry. Thanks so much ladies! Hannah said: “All the entries were very creative and everyone did a great job!. I picked Camilla’s dishes as a winner because those dishes could have been on a 5 star restaurant menu!“. Congratulations Camilla! …First time joining in CTB and walking away a winner! You can see all of the wonderful dishes Camilla made for her Wonka-inspired dinner here, at her blog Culinary Adventures with Camilla. It’s now time to pass the Cook the Books hosting torch along to Jo of Food Junkie Not Junk Food and our April/May selection, The United States of Arugula by David Kamp. And, I’ll be back briefly in a few days to announce our next three CTB picks–so stay tuned. Happy reading and cooking!